I think Vixen is capable of beating Isaiah Bradley. I don't think he'd make it easy. But I think she'd win. I decided to stage a scenario in MUGEN. Um...It's Black History Month. There are almost 300 Grudge Match posts on this blog. And very few of the majority of Characters happen to be black. This month I wanted to do Grudge Matches showcasing the best black fictional characters I have in my MUGEN Roster. March is Women's month so I might do all Women that month. If there is a match you want to see posted...please suggest it. I have only two Grudge Matches between Steel vs Bishop. I hardly call that "inundated" or "barraged". Besides there are only a few more I wanted to do. You may know that Dwayne McDuffie died last week. 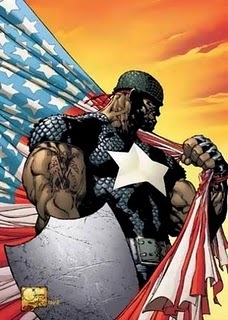 I recently found and reposted a video on my main blog commenting on Black character in Comics books and entertainment. Given the first posted comment I think his thoughts on the matter carry weight.